Government organizations are using both AR and VR in a variety of ways to improve workforce productivity as well as citizen service. The American Museum of Natural History is enhancing the experience visitors can have with dinosaur exhibits with the "Dinosaurs Among Us" app that is similar to PokÃ©mon Go. 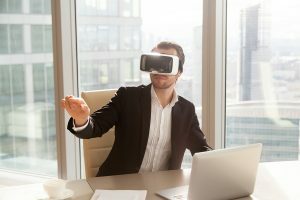 For government teams, virtual reality glasses are being used to replicate physical spaces so that someone at the office can see exactly what someone in the field is seeing. Annual NACO Conference & Exposition (July 13-16, 2018; Nashville, TN) - This event brings together a cross section of elected officials from localities large and small. The show provides an opportunity for sharing innovative practices and how technology is enabling more efficient work. VR and AR use cases will be discussed. Google Cloud Next (July 24-26, 2018; San Francisco, CA) - The innovators at Google as well as users will present a wide variety of presentations of how cloud-based technologies are being used today and what's coming next. VR and AR will be woven in across the eight main themes of the conference including application development, IoT, and mobility. Special Operations NEXUS (July 30-August 1, 2018; Tampa, FL) - This event is focused on how to advance the training and performance of Special Operations Forces (SOF). There will be strong focus on the "nexus" between physical, cognitive and virtual domains. 2018 Government Learning Technology Symposium (November 28-29, 2018; Washington, DC) -- Focused on the needs of Federal Government distance learning professionals, GLTS provides a venue for professionals to make connections, discuss the latest developments, and identify new regulations and trends including the use of VR and AR. Public Sector Innovation Summit (December 4, 2018; Washington, DC) - This event will explore how technology-driven innovation is advancing government. Top technology innovators and influencers across the public and private sectors will converge to discuss what's shaping the future of digital government. AR and VR will be discussed in this context. Let us know where you are learning about the application and implementation of AR and VR in government with a comment below. This entry was posted in Event News, Gov/Mil News and tagged AR, augmented reality, Mobile, training, virtual reality, VR by Kerry Rea President of GovEvents. Bookmark the permalink.